"UT-Austin reaches deal for new $338 million basketball arena" was first published by The Texas Tribune, a nonprofit, nonpartisan media organization that informs Texans — and engages with them — about public policy, politics, government and statewide issues. 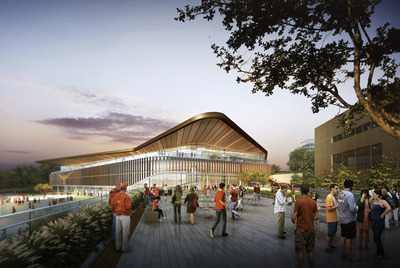 The University of Texas System Board of Regents on Thursday unanimously voted to authorize its flagship university in Austin to arrange for a private group to construct and manage a new $338 million on-campus basketball arena. The California-based Oak View Group will build the 10,000-seat venue and then convey it back to the university, school officials said. In return, the group will manage the venue, sell its naming rights and collect revenue from concerts and other events. Revenue from managing the stadium will allow the company to recoup its cost, officials said. The venue is scheduled to open in 2021. The Oak View Group will reserve a specific number of dates for University of Texas at Austin basketball games and other events. The arrangement — set to last for 35 years — means the university will get a new arena without having to spend any of its own money, school officials said. UT-Austin President Greg Fenves touted it as a first-of-its-kind deal. "This is a very exciting day for the University of Texas," he said. Once completed, the arena is expected to replace the university's 41-year-old Frank Erwin Center as the venue for basketball games, and outside events, like concerts, brought in by the corporation. UT-Austin reaches deal for new $338 million basketball arena By Matthew Watkins December 20, 2018 The University of Texas System Board of Regents on Thursday unanimously voted to authorize its flagship university in Austin to arrange for a private group to construct and manage a new $338 million on-campus basketball arena. The California-based Oak View Group will build the 10,000-seat venue and then convey it back to the university, school officials said. In return, the group will manage the venue, sell its naming rights and collect revenue from concerts and other events. Revenue from managing the stadium will allow the company to recoup its cost, officials said. The venue is scheduled to open in 2021. The Oak View Group will reserve a specific number of dates for University of Texas at Austin basketball games and other events. The arrangement — set to last for 35 years — means the university will get a new arena without having to spend any of its own money, school officials said. UT-Austin President Greg Fenves touted it as a first-of-its-kind deal. Image via The University of Texas. "This is a very exciting day for the University of Texas," he said. Once completed, the arena is expected to replace the university's 41-year-old Frank Erwin Center as the venue for basketball games, and outside events, like concerts, brought in by the corporation. Shannon Najmabadi contributed reporting. Disclosure: The University of Texas at Austin has been a financial supporter of The Texas Tribune, a nonprofit, nonpartisan news organization that is funded in part by donations from members, foundations and corporate sponsors. Financial supporters play no role in the Tribune's journalism. Find a complete list of them here. Read related Tribune coverage UT regents approve $175 million upgrade to Longhorns' football stadium UT Will Sell Beer at Football Games Without Stadium Home, Bats Invade Texas A&M; University Buildings "UT-Austin reaches deal for new $338 million basketball arena" was first published at by The Texas Tribune, a nonprofit, nonpartisan media organization that informs Texans — and engages with them — about public policy, politics, government and statewide issues. Link back to the original article, which is located at https://www.texastribune.org/2018/12/20/ut-reaches-agreement-new-338-million-basketball-arena/.